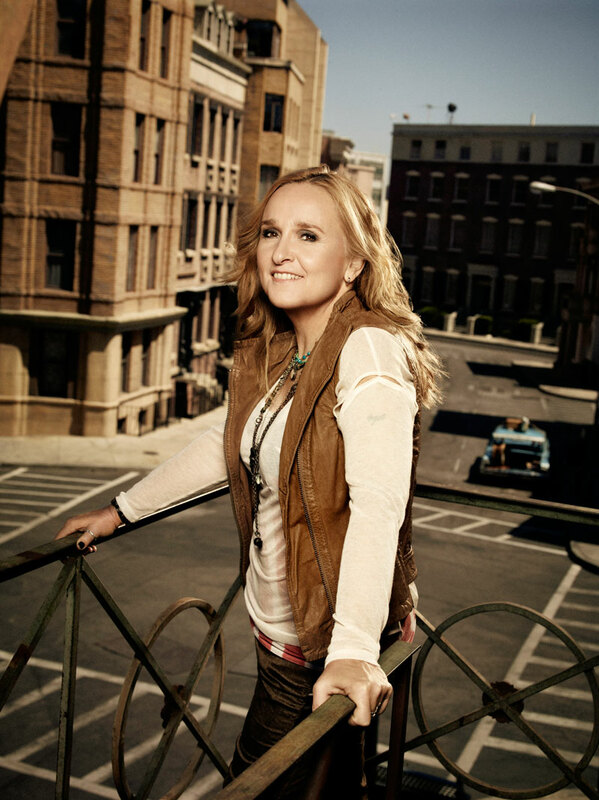 Rock singer/songwriter Melissa Etheridge released her 12th studio album, 4th Street Feeling, on September 4, 2012. Jacquire King and Steven Booker are the producers, and Etheridge plays all of the guitars on the bluesy rock album as well as harmonica, keyboards and the banjitar. 4th Street Feeling pays homage to her hometown of Leavenworth, Kansas, and she also returns to her musical roots all the way back to the beginning of her twenty-five year career and her self-titled debut album. Etheridge sings about past loves on this CD with angst and heartrending melodies, but there are also tunes of joy, triumph and romance while her excellent guitar work showcases her signature raspy, smoky voice. The openly gay artist is a breast cancer survivor, has two children from a long-term partnership with Julie Cypher and two with domestic partner Tammy Lynn Michaels. Etheridge and Michaels separated in 2010, and the singer is currently in a relationship with Nurse Jackie co-creator Linda Wallem. Melissa Parker (Smashing Interviews Magazine): Melissa, I cannot say enough great things about this album! Melissa Etheridge: Oh, that means so much. Thank you, Melissa. Thank you! Melissa Parker (Smashing Interviews Magazine): The production is also perfect. Why did you choose not to use John Shanks this time? I needed producers who were sort of retro in their thinking, in their feeling. Jacquire King was the first one on my list. I just loved what he did with Norah Jones and Kings of Leon. He just has a great feeling, and it was a wonderful experience with him. Then, I did a couple of songs with Steve Booker. Again, the same. They just came in and listened to me, my drummer Blair and my bass player Brett. The three of us have been playing together for a couple of years. They just took what we did and surrounded it with the best sounds and just made it the greatest it could be. Melissa Parker (Smashing Interviews Magazine): Yes, they did. The theme of the album is going back home. You are also returning to your rock roots, as you’ve said, to your first album. I’m also hearing some similarities to Yes I Am in 1993. Melissa Etheridge: Yeah. Yes I Am was the fourth album. It’s what I do best. When I’m playing live, those are the songs that everybody just loves. I thought, “Why not just make the music I love? Why not just play some great rock and roll?” So, I went back to my roots to get that inspiration again, not necessarily to make the music again, but to feel like I did, and that’s where the song, “4thStreet Feeling,” came from. It’s a memory of being in my car, my very first car for the first time and listening to the music I wanted to listen to all the way down that drag of 4th Street and falling in love with Fleetwood Mac, Bob Seger, Bruce Springsteen, great rock music, R&B and country, the roots that my love of music come from. Melissa Parker (Smashing Interviews Magazine): I have the line, “A hundred miles to go to Kansas City,” from the song, “Kansas City,” stuck in my head, and I can’t get it out (laughs). Melissa Parker (Smashing Interviews Magazine): It’s just going round and round. Melissa Etheridge: Oh, I’m sorry (laughs). Melissa Parker (Smashing Interviews Magazine): That’s a good thing (laughs). What is that called … an earworm? Melissa Etheridge: Right, yes, yes. Good, good. Melissa Etheridge: Yea! That’s what it’s for, yea! Melissa Etheridge: Gee (laughs). I have artistic license to let you imagine whatever you wish to imagine. That’s all I can say (laughs). Melissa Etheridge: Now, that I can say definitely, “Yes, indeed.” That is about my new love of my life. Yes. There is some healing going on there. Melissa Parker (Smashing Interviews Magazine): You are happy in a relationship right now? Melissa Etheridge: Yes. I’ve learned to love myself, so that helps also with the partner you pick … when you’re actually loving yourself. Melissa Parker (Smashing Interviews Magazine): “Rock and Roll Me” is definitely a sensual bedroom song. Melissa Etheridge: Yes, it is (laughs). Melissa Parker (Smashing Interviews Magazine): What in the world possessed you to play all of the guitar parts on the record? Melissa Etheridge: Well, because I have … it has been a journey of growing as a musician. I’ve always relied on my voice. I play the guitar very well, and yet I would always turn the lead guitar parts over to the lead guitar player. In the last two years, my lead guitar player has been a guy named Peter Thorn. He is amazing! He’s just one of the greatest guitar players I’ve ever played with, yet he doesn’t have an ego like many guitar players have. Peter would encourage me and say, “You step up and play a little bit.” I started stepping up, playing more and more in concerts. I thought, “Wait a minute. I can do this! I can take the lead. I can be that lead.” I went to the studio and said, “I’m going to do this. I’m going to play all the guitars.” It was scary as heck, but I loved it. Melissa Parker (Smashing Interviews Magazine): Was the banjitar a difficult instrument to learn? Melissa Etheridge: No. Actually, the banjitar is quite easy because it is just like a guitar with a banjo body. I play the banjo and wanted to put a banjo on the song (“Falling Up”) because I hear that the kids are listening to them nowadays (laughs). I brought my banjo, and my guitar tech said, “Hey, I have a banjitar.” I play the banjo okay, but I play the banjitar really well because it actually feels like the guitar. It’s very particular, but actually quite easy. Melissa Parker (Smashing Interviews Magazine): Easy for someone as multi-talented as you. Tell me a little about your childhood in Leavenworth, Kansas, Melissa. Melissa Etheridge: Well, it was kind of like a Midwestern childhood. We were taught to be nice, work hard and not talk about your feelings. I had a lower middle class family. It was, “Just don’t be different, and we’ll all get along.” That’s where I started playing music and started loving music. I started writing music when I was in high school and started becoming such a rebel. But I was supported and loved by my family, my high school and town. I’m not one of those rock stars that got into trouble. I wasn’t into that. I was into the artistry of it, the music and just wanting to do it. I loved my childhood. Melissa Parker (Smashing Interviews Magazine): I read that your sister received a guitar as a gift and she wasn’t interested. Melissa Etheridge: Yes! I was eight years old and said, “Please let me play this!” I just bugged them to death, and they finally said, “Okay.” They thought I’d quit after a couple of lessons, but my fingers bled, and I kept playing … just kept playing. Melissa Parker (Smashing Interviews Magazine): Why are you always described as an “activist,” but you’re never seen out there on a picket line? Melissa Etheridge: Exactly (laughs). I am the least active activist ever. Melissa Parker (Smashing Interviews Magazine): Is it because of your honesty? Melissa Etheridge: Yeah. I find that I’ve chosen for the last twenty-five years to speak honestly when I’m asked, to just speak truthfully and say, “Yes, I’m gay. Yes, I’ve had cancer. Yes, this is what it was like. Yes, I smoke medicinal marijuana.” Whatever it is that I’m known to be an activist for, I answer truthfully whether it’s about the environment or whatever. These things are definitely important to me, and they are in my life. I don’t feel the need to go march anywhere or do anything or make anybody else think the way that I do, but I become an activist by just speaking my truth when asked. Melissa Parker (Smashing Interviews Magazine): You’ve recently said, “I’m for gay divorce.” Is that because your last one was so difficult and messy? Melissa Etheridge: Well, yeah. But I’ve gone through two divorces now, and they have been extremely expensive. Divorce is expensive anyway, and so is marriage, but it was made ever more so by the fact that there were no laws governing it. Straight folks can get married, and if they break up, they can divide the money in half or however their state allows them to, and they don’t have to pay taxes on it. They don’t have to make up rules. We’re all just doing it the best we can now, and it’s very expensive. It doesn’t protect the children. Isn’t that what family law is about, protecting the children and helping people walk through messy things? Melissa Parker (Smashing Interviews Magazine): It should be. How are your kids? Melissa Etheridge: They’re delightful. Oh my God, they are incredible! I’ve got two teenagers and two soon to be six year olds. Melissa Parker (Smashing Interviews Magazine): Any budding musical geniuses? Melissa Etheridge: We have a lot of music in the house, and so music is a part of the family. My oldest daughter loves the music of Broadway, has a beautiful voice and can play piano very well. I don’t know if she’ll pursue that as her lifelong dream, but they all have musical talent. Melissa Parker (Smashing Interviews Magazine): Is there anything you’d like to do professionally that hasn’t been done? Melissa Etheridge: Oh, gosh. I’d love to do a musical on Broadway and do more music for film. There’s lots of stuff to do. Melissa Parker (Smashing Interviews Magazine): Has being in your 50s slowed you down any, particularly on stage? Melissa Etheridge: No. I’m actually healthier than I was in my 30s. Having gone through breast cancer taught me the joys of having a balanced body in life and health, and that I am what I eat. I hike, I do yoga, I do kickboxing, so I’m healthier and stronger and better on stage than I’ve actually ever been (laughs). I’m doing well. Melissa Parker (Smashing Interviews Magazine): And your health is good? Melissa Etheridge: Yes, it is … very good. This was a great interview. The questions were well thought out and you could tell the interviewer was a fan/listener of Melissa’s songs. She seemed to be up on her life or had done some good homework. Thanks for not making it yet another interview of the same ol’ questions. I Guarantee A Grammy From This Album Mark My Word !!! !